You don’t have to be a data whiz. You’ll get actionable insights into your daily business at each level of your sales funnel in the simplest form possible. We don’t teach you how to be a data analyst, we show you how to use your data efficiently and intelligently. No recurring charges. Access to content and reports is good for life. 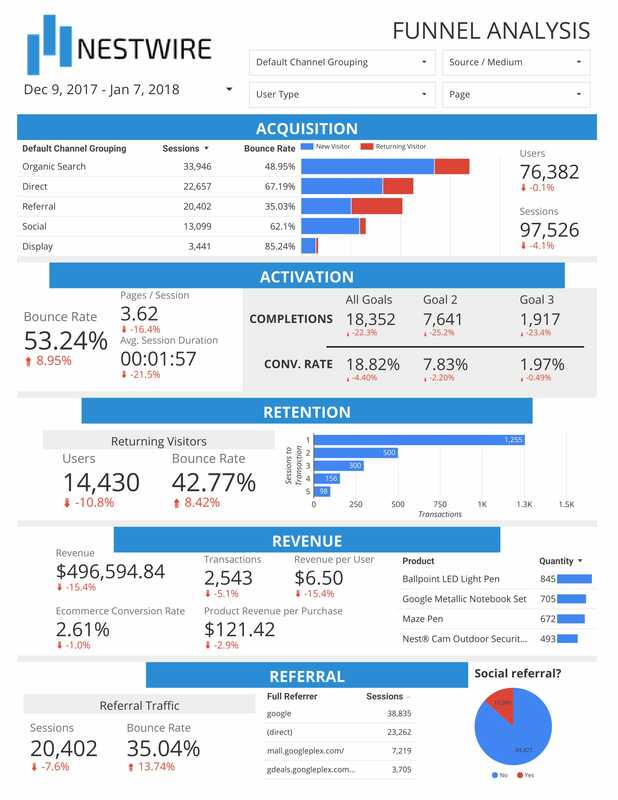 See all of your most important metrics on one page with the Nestwire funnel analysis report. Learn how to spot optimization and growth opportunities in our free minicourse. Get the one-page funnel report plus in-depth, customizable reports for each level of your customer funnel. Lifetime access to our Pro Course to help you pinpoint the best opportunities to grow your business. Access to all of our course material and premium content. Customized, expert report setup and one month of funnel analysis consultation. Need to drop us a line? See our contact page.